Fiction – paperback; Headline Review; 152 pages; 1999. For the past four years I’ve been slowly making my way through Jennifer Johnston‘s extensive back catalogue of novels. 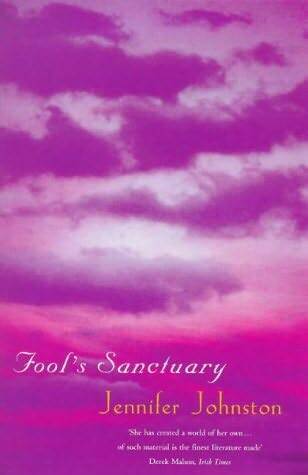 Fool’s Sanctuary, first published in 1987, is her eighth book — and my eleventh. There’s something quite comforting about entering JJ’s fictional world, and it has nothing to do with the subject matter, which can often be dark and disturbing, but more to do with the way in which she handles words and stories, and, above all, treats her readers with intelligence. Her prose style is not at all descriptive or explanatory, so that you often have to figure things out as you go along, and most of the action moves ahead via dialogue, some of which is extraordinarily confusing as several conversations play out between characters all at the same time. But there’s something about her style, which also interweaves first and third person narratives, that gives her novels a distinctive, familiar and occasionally ambiguous flavour. I dare say it’s a flavour you either love or hate, but for me, her novels are a special kind of heaven. Fool’s Sanctuary is no exception, although it seems far darker than any of her more recent forays into fiction. This one is set during the Irish Civil War, circa the late 1920s, and most of the action takes place in a big house in an area on the coast north of Donegal known as Termon (which is essentially Irish for “sanctuary”, hence the novel’s title). The story opens with an aged Miranda Martin lying on her death bed, looking back on an evening from her youth that was to shape the rest of her life. In a narrative that swings from the past to the present and back again we discover how Miranda and her tree-loving widowed father got caught up in events that were much bigger than their quiet, peaceful lives. By page 7 we already know that Miranda’s young lover, Cathal, was taken away that night and shot in the head, but we don’t know why this happened or what events lead up to his death. It’s only when Miranda’s older brother Andrew returns home on leave from the British Army that you get the first inkling that all is not well within the family. Andrew, a survivor of the Great War, is dismissive of the Irish desire for Home Rule and belittles his father’s goals of reafforestation and land reclamation as nothing more than “romantic rubbish”. The tension between the two factions — the pair of British soldiers on leave for a few days, and the Anglo-Irish father and daughter, who still reside in Ireland — merely mirrors the nation’s predicament. But even without the politics, this is a heart-hammering drama that pits nice, well-meaning people against each other only to result in tragedy. That Johnston achieves this in just over 150 pages, without getting bogged down in extraneous detail (nor preaching), is nothing short of stunning. As ever, what JJ delivers is a carefully crafted novella of immense power. And if you’ve not read anything by this Irish author before, this is a good a place as any to start. The other two Jennifer Johnston books I’ve read have been fantastic and I’ll be looking out for this one, as well. It sounds very good indeed, Kim. It was all thanks to you that I was introduced to Jennifer Johnston when you chose ‘The Illusionist’ for the Not The TV Book Club and I loved it, its stayed with me ever since too. This sounds like it could be the perfect second foray into her work, I do like the darker books by any author it seems. Have read one of hers before, and this afternoon I plan to start reading “The Christmas Tree”, one of your favorites. “Her prose style is not at all descriptive or explanatory”. I think that is what makes Jennifer Johnston’s writing so powerful, her immediacy. She gets right into the drama and the dialogue without spending a lot of pages on description. I believe she worked in the theatre a lot, and it shows in her novels.